I have something to admit: I have felt a twinge of silliness after finishing a race and wearing a medal around my neck. After all, I am an adult and I don’t really need a congratulatory medal to tell me “good job”. In addition, with the exception of a few 5k medals where I won my age group, all my medals are “finisher’s medals”. I've often wondered, “Do I deserve a medal for just ‘finishing’ something I started? But lately my attitude towards these medals has started to change. For instance, the 2010 Baltimore Half Marathon medal quickly brings a smile to my face. That was my first half marathon. I was so nervous I barely told anyone I had even signed up for the race for the fear that I couldn’t finish it. When I got halfway through mile 11 I started get tears in my eyes because I knew I would make it. I’ll never forget those goose bumps when I crossed the finish line. I have the same thoughts about my 2012 Pittsburgh Half Marathon Medal. That’s the medal I proudly think of as “the comeback”. As quickly as I had reached the high of finishing my first half marathon in 2010 it came to a crashing low in 2011. An MRI and the words, “scarifying of the tissue” around my knee sent me to three months of physical therapy. I was sad. I was nowhere near the runner I had known just a year ago. I started to wonder if I could ever finish a half marathon again. Sitting, walking and running were extremely painful. But slowly I got better and decided to give it another shot. 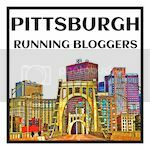 I signed up for 2012 Pittsburgh Half Marathon and started running. At first I could only run one mile, but eventually I got back to eleven miles to prepare for the race. This time tears came at the finish. Not only had I finished but I had a personal best. I was back. The 2013 Pittsburgh Marathon medal is the heaviest medal I own. It is literally made of steel. Sometimes I still stare at it in disbelief. I always thought it was ridiculous that a human body could run 26.2 miles, let alone that my human body could run 26.2 miles. It is a constant reminder that I achieved something that once seemed impossible. Then there is that one medal that glows in the dark. That is my 2013 Las Vegas Rock and Roll Half Marathon medal. What makes me happiest about this medal is that there are two of them. Bobby and I ran this race together. In 2011 he spent 6 months in physical therapy after reconstructive ankle surgery. He had wondered if he could ever run again. Now he was running half marathons. We finished, hand in hand, in front of Caesars Palace where we were married. When I signed up for the 2014 6.6k, it seemed like an insignificant race. It’s definitely not a well-known distance. But having a miscarriage two weeks prior had changed all that. I needed this race. When I ran this race I knew I was a changed person. Instead of being timid, I was aggressive and attacked the course. But I also noticed the other runners around me more. Instead of seeing runners, I saw people who had struggles and heartbreak in their own lives. I didn’t know about their suffering and they didn’t know the hell I had been through. But we were all in this together; moving one foot in front of the other. It was symbolic. It was beautiful. Now when I look at that medal I have that answer. It reminds that it’s ok if you didn’t get the result you expected. It’s ok if you achieved something amazing and still weren’t satisfied. It’s courageous that you tried again even when you weren’t sure you would succeed. It’s admirable that you set yourself up to potentially fail. But you didn’t. You found out you were better than you ever believed. Now when I look at my medals I don’t just see some award I picked up at the end of race. I see the story of my life. Although the medals represent the “highs” I’ll always remember the “lows” in between. I’ll remember the stories of pain and struggle. But I'll also remember the stories of perseverance and triumph. The Mario Lemieux Foundation 6.6k Run and Family Run was held on October 5, 2014. It turned out to be a rather chilly morning with temperatures starting off in the 30's! I spent most of the night before the race digging out my cold running gear that had been packed away for the summer. Even though it was cold, it was an absolutely beautiful fall morning. Bobby and I brave the cold before the Mario Lemieux 6.6k. The Pittsburgh Skyline before the race. October 5th also happens to be Mario's birthday! Before the race all the participants sang 'Happy Birthday' followed by the national anthem. So what is a 6.6k anyways? It's a 4.1 mile run. I like to think of it as a 5k plus one mile. Mario shot off the starting gun and we were off. By off I mean a very steep downhill. Between the steep downhill and the glare of the sun I just wanted to maintain control and not run into anybody. The end of the downhill was actually a relief. We headed on Fifth Avenue towards downtown. The theme of the race was two bridges, one tunnel. Our first bridge was Smithfield Street bridge. One of my favorite parts about running Pittsburgh is running the bridges. Smithfield Street provides great views of the city. Once we crossed our first bridge we made a left onto East Carson Street. We didn't stay there long but cut down a side street to run some back streets in the South Side. One of my favorite things about this race was running streets I've never ran in a race. Every turn was a surprise and I was always wondering where we would go next! Next we were on our way to the 10th street bridge. The incline on this bridge felt pretty steep. I was relived when we reached the crest and got to coast on a downhill. Next we did a quick loop on Second Avenue. I didn't expect this loop but it was really cool to see some of my friends on the turnaround. After the turnaround we headed to the Armstrong Tunnel. I've ran in this tunnel before but it was always the opposite direction (downhill). Now I was going uphill. I decided to be aggressive in the tunnel and try to get up the incline as quick as possible. I was speeding up the incline passing people as I went. When I got to the top I felt gassed. "Maybe that was too aggressive." Fortunately there was a nice downhill and some friendly supporters when we exited the tunnel. But the downhill didn't last long. As we made a right onto Sixth Avenue the long climb to the finish began. My goal going up the hill was to not slow down and to not stop running. As we turned onto Centre Avenue that goal became more and more difficult. I could see the finish but I was gasping for air and trying to hold on to my breakfast. Bobby was right next to me. "I should grab his hand." I looked ahead. There was Mario standing at the finish. One of the greatest hockey players of all time. "I should give him a high five." "I feel like I'm going to throw up!" I put out my hand. Not quite far enough. No high five. I crossed the finish line and immediately go to my knees trying to catch my breath and hold on to my breakfast. No high five from Mario. No hand holding finish with Bobby. Oh well. Maybe next year. I ended up crossing the finish line in 40:02. So close to being under 40 minutes! The finish line behind the Mario statue outside Consol Energy Center. After the finish we made our way to finish area. We were presented with our medals which matched our long sleeved technical shirts. The 6.6k medal and technical shirt. In the finish area we were presented with water, sports drink, bananas and of course a smiley cookie! There was plenty of food and lots of space to meet up with fellow runners. Christina and I after the race. After the race we were invited into Consol Engery Center to watch the Penguins Practice. There were concession stands open so we grabbed some coffee to warm up and chicken fingers to eat and then headed to the seats to watch the Pens practice. After the race, we watched the Pittsburgh Penguins practice. I never watched a hockey team practice before so it was pretty cool to watch Sydney Crosby and company go to work. I wish I could skate like them. Or just skate as well as I run! Trying to warm up after the race! This race provided a unique opportunity to run, support a charity and then watch a professional sports team practice. I can't think of any other race that presents this combination. Along with the 6.6k there was a one mile family walk that also permitted dogs. This race really had something for everyone! The race was really organized and the volunteers were some of the nicest I've met. My only gripe would be the long uphill finish, but I really did feel like I earned my medal at the end of it! I'll definitely keep participating in this race for years to come.